It's been a long time since the iconic Cook Strait and the Marlborough Sounds echoed to the sound of a thundering V8 Offshore Powerboat, but that became a reality today when the Fairview Windows and Doors Offshore Superboat team of Warren Lewis and Chris Hanley made their historic and successful attempt on the long standing, fastest ever Cook Straight crossing between New Zealand's North and South Islands and back, known as the BP Straits Trophy. After a long wait over the past couple of months waiting for an ideal weather window, the team received advice from various local fishing vessels and experts earlier this week that today (27.9.12) would be an ideal day to make an attempt. Fairview team crew chief John McLean towed the big NZ1 Skater catamaran South yesterday, with Warren Lewis and fill-in driver Chris Hanley flying into Wellington this morning. 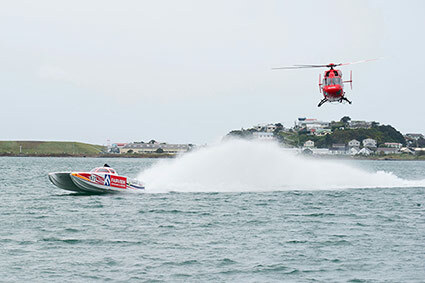 Andrew 'Flea' Coolen was originally supposed to drive, as he has done throughout Fairview's 2012 NZ Offshore Powerboat Championship winning season, but business commitments meant that the experienced Chris Hanley was called in at late notice. After a challenging first attempt, the BP Straits record now stands at one hour, thirty-three minutes, and nineteen seconds (1:33:19). The intention originally was, depending on the conditions, for Fairview to lower the existing record to less than one hour and ten minutes, but Cook Strait proved that it can be a very tough and daunting place to cross at the best of times, as many have found in the past. While it looked like the weather window was close to ideal, marine conditions can change in as little as fifteen minutes. "Once we got out past the Wellington Head's we struck a massive rip, and our boat speed was down to just 40mph! Not an ideal start and even Chris expressed his concerns at that time about turning back around", explained Warren Lewis afterwards. "We couldn't get on top of the waves, with the conditions some of the worst I've been in, but we made the decision to look for better water further out, and use this as a shakedown run, thinking we weren't going to break the record first time out". From just 40mph in the early part of the crossing the Fairview found it's legs in the Marlborough Sounds on the way to Picton hitting speeds of up to 132 mph. According to NZ Powerboat Association records, The BP Straights Record Trophy was first held in 1967 by a boat called 'Miss Bertram' which crossed Cook Straight in three hours and forty minutes between Evans Bay in Wellington and Picton and then back to Evans Bay. The last known official record was set by a Mono hull boat named 'Aurora' back in 1984, crewed by Kevin Green, Ned Rowe, and Des Deacon. Aurora set a time of one hour, forty-three minutes and two seconds which still stands today for the distance. It is now understood that former NZ Offshore Champion Graeme Horne in the Fleetlease Offshore catamaran made an attempt on the Cook Straight record in the late eighties, breaking the Aurora record, but there is some confusion whether or not the record was ever ratified. The time was one hour and thirty-seven minutes. Warren Lewis and Chris Hanley have now beaten that time by four minutes, and Aurora's time by ten minutes. Warren Lewis and the Fairview team confirmed after the successful first attempt that they are keen to have another go in the future, but are happy to wait for another attempt by someone else first, and if that's successful, will look at reclaiming it back once their new BP Straits record is broken. "As New Zealand GP Hydroplane legend Peter Knight said in his book, if you go out to beat your own record, that's when things can and will go wrong", said Lewis, safely back in Wellington celebrating the new record for the Fairview team. 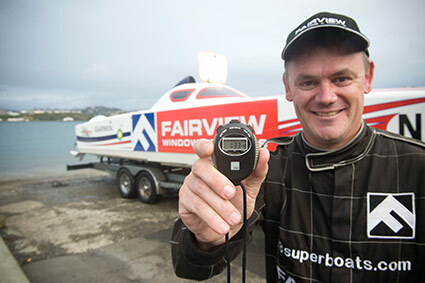 The Fairview Windows and Doors Offshore Superboat is already NZ's fastest Offshore Powerboat at 136mph (219kph) set on Lake Karapiro, and also holds the current record for the Auckland Harbour Bridge to Great Barrier Island and return run of one hour, six minutes and fifteen seconds set back in 2009, smashing the previous record. The 'Fairview Windows and Doors' Offshore Superboat is a state of the art, thirty-five foot long Skater catamaran imported from the USA, powered by a pair of 502 cubic inch, 525 horsepower, Mercruiser Big Block V8 engines, producing over 1000 horsepower combined.